School and college underway here for all the big children, and back to the hard work that is taking care of two smalls during the day. Throw in a market day, some slinging stuff and some LLL stuff, plus a little sewing lesson, and yep we've been busy! 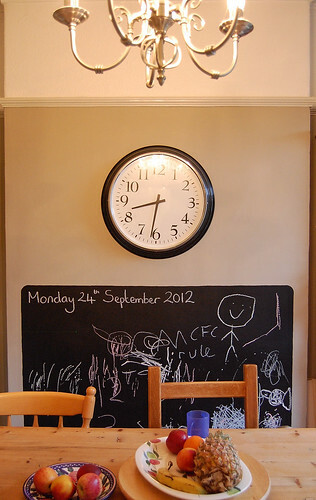 Today was a quieter day than usual, and I finished this chalkboard for the smalls to play with. And Ernest has been perfecting his toast making skills. 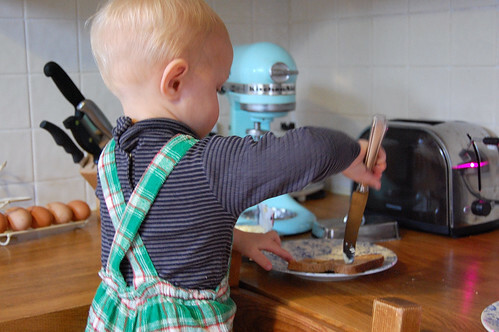 Aww, Ernest making toast is just too cute. I feel slovenly by comparison! i love his dungarees...do you sell some like them? or the fabric? can't believe how grown up he is! So sweet, little Ernest making toast.... Toast is extra prestigious in our house as we are often without electricity, especially during the Winter. When we do get it we LOVE every bite! 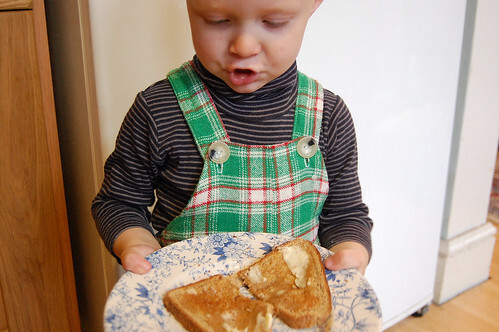 My little man loves making toast as well, although he is not quite so little anymore!